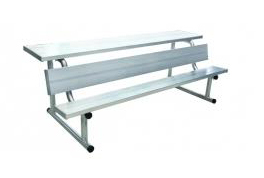 Aluminum benches provide you with years of maintenance-free use by providing the utmost in weathering resistance. Bench seat is 10” wide and 1’6” high. Available with or without back or with shelf (and back). Available in 15 powdercoat color options - Call us to order these. Items ordered online will be aluminum finish.